The cost of scaling conventional routing solutions such as MPLS and segment routing are rising much faster than revenues, and many legacy systems are now running at close to full capacity with only prohibitively expensive options for expanding capacity. SDN provides a path to moving these services to a far less costly and more scalable infrastructure, but replacing entire networks requires massive up-front capital expenses and puts mission applications and revenue streams at risk. 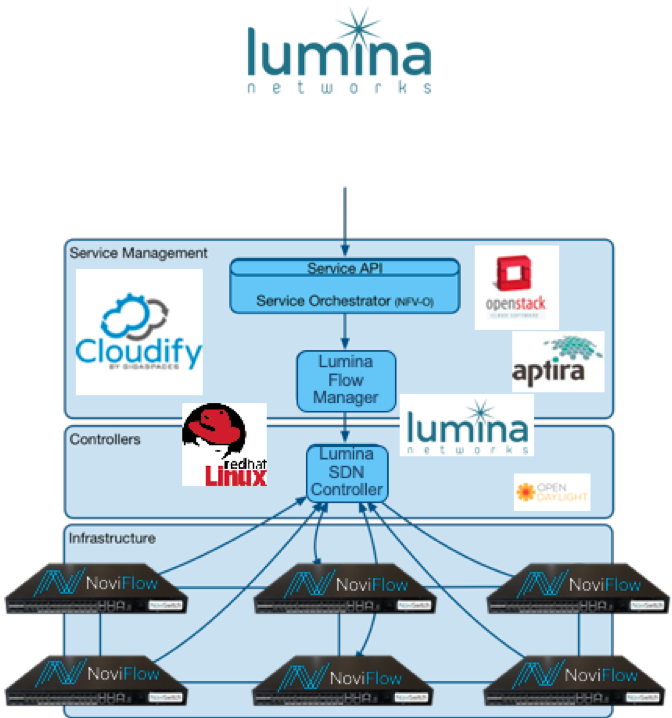 NoviFlow and Lumina Networks’ joint SD-Core Networking Solution delivers the ability to both manage the graceful transition of services to SDN while retaining existing infrastructure, and to scale the resulting mutidomain network into the Terabit range. Lumina’s SDN Controller provides OpenFlow control to the data plane, while working with the network’s legacy routing software to integrate seamlessly with existing network nodes and across domains. NoviFlow’s NoviSwitches – including the 6.5 Tbps Tofino-based NS-5165 – combine with Lumina’s SDN Controller to deliver carrier-grade MPLS, segment routing and traffic engineering core router capabilities at a fraction of the cost of proprietary vendor solutions. The solution is built to allow the gradual migration of MPLS services – point-to-point E-line, L3VPN, E-tree, etc. and other routing services such as segment routing, to less costly SDN infrastructure, allowing the capping of investment of legacy core routers, while the network evolves to deliver new SDN-based services. The SD-CORE and NoviWare joint solution delivers an unprecedented degree of flexibility and performance, enabling network operators to dynamically scale services as demand fluctuates, reduce management and operating costs, as well as make possible the gradual transition of mission critical traffic from expensive legacy systems to more economical switching and routing infrastructure.